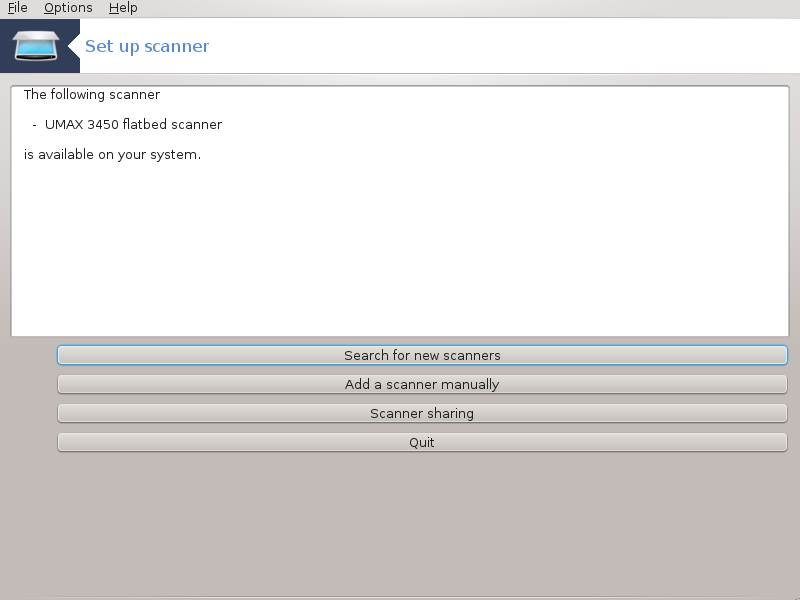 This tool  allows you to configure a single scanner device or a multifunction device which includes scanning. It also allows you to share local devices connected to this computer with a remote computer or to access remote scanners. Do you want to install the SANE packages?" Choose Yes to continue. 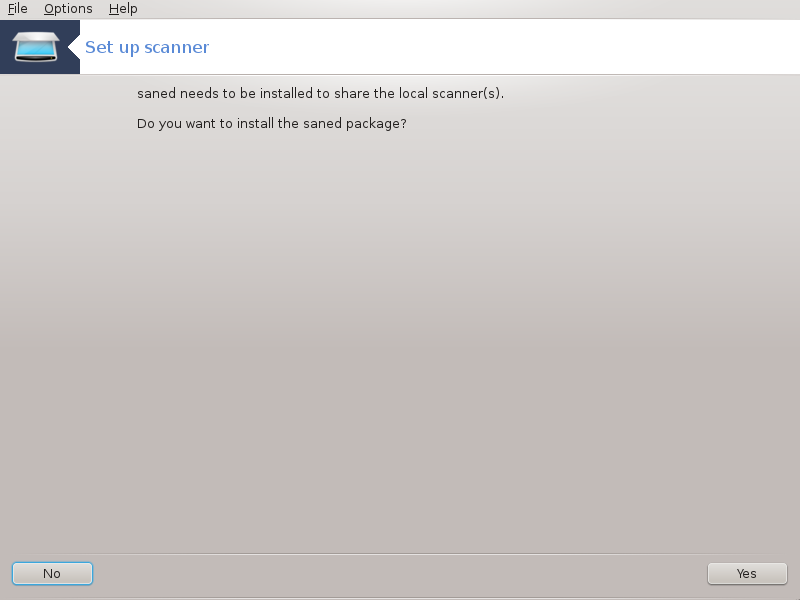 It will install scanner-gui and task-scanning if they are not yet installed. If your scanner is identified correctly, so if in the above screen you see the name of your scanner, the scanner is ready for use with, for instance, XSane or Simple Scan. In that case, you might now want to want to configure the Scanner sharing option. You can read about it in the „Scannersharing”. However, if your scanner hasn't been correctly identified, and checking its cable(s) and power switch and then pressing Search for new scanners doesn't help, you'll need to press Add a scanner manually. Please check whether your scanner is supported on the SANE: Supported Devices page and ask for help in the forums. You can leave this setting to Auto-detect available ports unless your scanner's interface is a parallel port. In that case, select /dev/parport0 if you have only one. After clicking Ok, in most cases you will see a screen similar to the one below. If you don't get that screen, then please read the „Extra installation steps”. Here you can choose whether the scanners connected to this machine should be accessible by remote machines and by which remote machines. You can also decide here whether scanners on remote machines should be made available on this machine. Scanner sharing to hosts : name or IP address of hosts can be added or deleted from the list of hosts allowed to access the local device(s), on this computer. Usage of remote scanners : name or IP address of hosts can added or deleted from the list of hosts which give access to a remote scanner. Scanner sharing to hosts: you can add host. 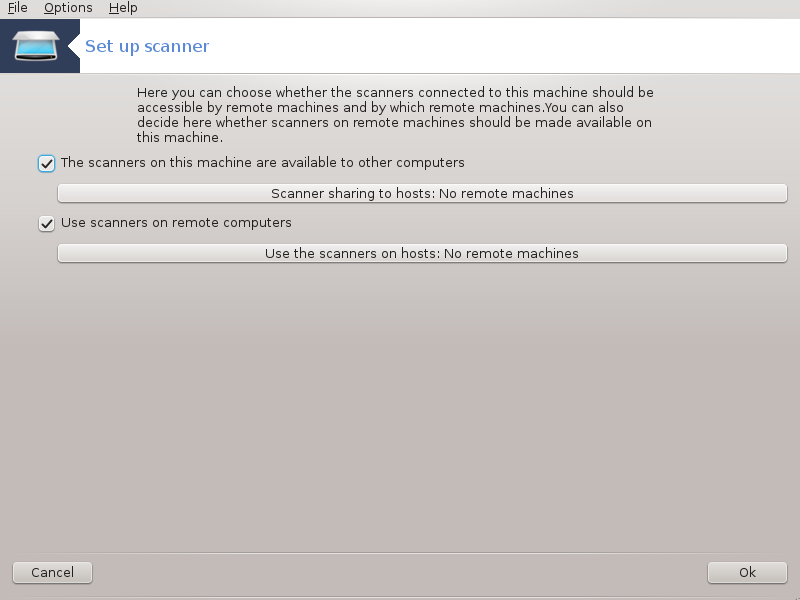 Scanner sharing to hosts: specify which host(s) to add, or allow all remote machines. "All remote machines" are allowed to access the local scanner. If the package saned is not yet installed, the tool offers to do it. /etc/sane.d/dll.conf to add or comment the directive "net"
It will also configure saned and xinetd to be started on boot. 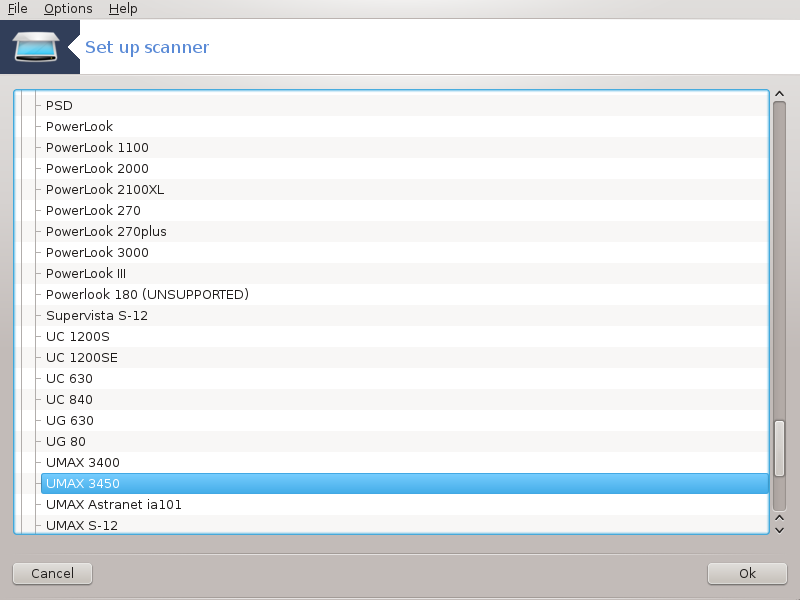 Most HP scanners are managed from HP Device Manager (hplip) which also manages printers. In this case, this tool does not allow you to configure it and invites you to use HP Device Manager. Drivers are available from this page. When indicated, you must install the iscan-data package first, then iscan (in this order). It is possible that the iscan package will generate a warning about a conflict with sane. Users have reported that this warning can be ignored. It is possible that after selecting a port for your scanner in the Rysunek 1, „Choose port” screen, you need to take one or more extra steps to correctly configure your scanner. In some cases, you're told the scanner needs its firmware to be uploaded each time it is started. This tool allows you to load it into the device, after you installed it on your system. In this screen you can install the firmware from a CD or a Windows installation, or install the one you downloaded from an Internet site of the vendor. When your device's firmware needs to be loaded, it can take a long time at each first usage, possibly more than one minute. So be patient. Also, you may get a screen telling you to adjust the /etc/sane.d/"name_of_your_SANE_backend".conf file. Read those or other instructions you get carefully and if you don't know what to do, feel free to ask for help in the forums. You can start this tool from the command line, by typing scannerdrake as root.